Hospice care. For those with a life-limiting illness, hospice provides comfort, symptom management and emotional support for patients and their families. Hospice services – nurse visits, home health aides, social workers and chaplain visits – are usually provided in patients’ homes. I’m excited and honored to tell you that this fall, I’m teaching a new two-session course called “Let’s Manage Late Life Well” at the Lois E. Marshall Institute for Learning in Retirement (ILR) at Bergen Community College in Paramus, NJ. The course will be offered on October 31 and November 7, from 10:30 a.m. to 12:00 p.m. You can register for this and other courses at the ILR starting on Monday, August 29. Too often, caregivers and people struggling with serious illness face medical crises that leave them feeling confused, frightened and overwhelmed. The best way to prevent that feeling of being lost and powerless in the health care system is by becoming better educated before a medical crisis hits. The course is designed to help people become better educated about what good quality care looks like; as well as how to communicate better with health care professionals; how to make better-informed decisions for themselves or their loved ones; and how to find the information we all need about the conditions that we are likely to face in late life. “Let’s Manage Late-Life Well” is a “bonus” course, offered at no extra charge with ILR membership for the Fall 2016 and Spring 2017. ILR membership entitles you to four courses each semester, plus two additional “bonus” courses. Full membership fee for Fall 2016 and Spring 2017 is $215. Registration begins on August 29th for the Fall 2016 semester. 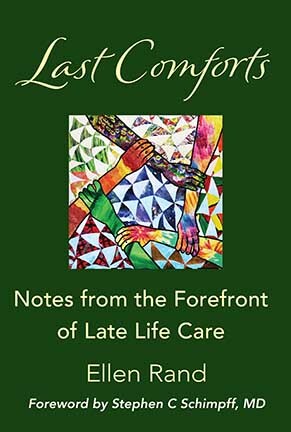 •	An overview of innovations in late-life care (including those in NJ). •	How to communicate better with our health care specialists. •	How to learn about the quality of care in hospitals and long-term care facilities. •	Better alternatives to conventional skilled nursing homes. •	Strategies and tips for those caring for loved ones with dementia. •	What you need to know about advance care directives vs. POLST (Physician Orders for Life Sustaining Treatment) forms. •	Dispelling the many myths about palliative and hospice care. •	Plus: Where to find help: useful resources and links for caregivers and for people contending with serious illness. Sometimes you find a hero in the unlikeliest of places. This week I came upon an obituary for Dave Schwartz, 63, a long-time Weather Channel meteorologist. He had twice overcome pancreatic cancer 10 years ago, but began his struggle anew with a stomach cancer diagnosis in 2015. Mr. Schwartz had joined the Weather Channel in 1985, initially as a newsroom assistant at the same time that he was working for the Fulton County Health Department in Georgia. He became an on-camera meteorologist in 1991. Cancer, like so many serious illnesses, is often enshrouded in silence and secrecy. It would have been understandable had Schwartz decided to simply take the time off that he needed to undergo treatment and then return to work without talking about his absence. Instead, he chose Feb. 4, of this year, World Cancer Day, to address his viewers. I found Schwartz’s comments – not to mention the bravery in sharing his struggle publicly – deeply moving. And it made me think about how powerful storytelling is. We can learn so much from others not only about the nature of some of the more pernicious illnesses that afflict people, but also about how we can confront illness – mortality itself – with something approximating appreciation for the gift of life in the moment and maybe even a hint of grace. And it also made me think: Wouldn’t it be helpful if more public figures could follow Dave Schwartz’s lead and talk about the struggles they might be experiencing and, along the way, educate us about what treatment and living with illness is all about? And while we’re at it, wouldn’t it be helpful if these folks could make some news by talking about and signing advance care directives? Maybe talk about how they thought about the prospect of measures like CPR, feeding tubes and intubation and decided, “Nope. Not for me.” And then maybe figure out a way to have it go viral, much as the “ice bucket challenge” did for ALS. That would be pretty heroic, too. What’s Your Big Idea About End-of-Life Care? The Aspen Institute Health Strategy Group wants to hear from us, by June 1 . Specifically, in advance of its Spotlight Health session in June, it wants to know: what is our big idea about end-of-life care? From my vantage point as a hospice volunteer, seasoned journalist and author of a just-published book about end-of-life issues, my big idea is that at age 40+, hospice in the U.S. is in the midst of a mid-life crisis and needs a radical transformation. Not in its philosophy or system of care, but in how it is paid for. It’s time to start from scratch and design end-of-life benefits based on people’s needs, not on their prognosis. Although hospice benefits are continuously being tweaked, their broad outlines have not fundamentally changed since its inception. But the very nature of the end-of-life experience now is far different than it had been in the 1970s, when hospice cared mostly for people with cancer. Hospice was not envisioned to address the needs of the frail elderly living with multiple chronic conditions, or the ravages of dementia, whose disease trajectories are certainly far less predictable – and often more complex — than cancer. Two of the essential elements of the Medicare hospice benefit have come to haunt us. First, it is based on prognosis, that is, it is available for a limited time – six months if the illness runs its normal course. Second, it requires that a person give up any treatment or care that might be deemed “curative.” The choice is stark: cure or care. Either/or, but not both. Hardly surprising, then, that so many people do not even choose hospice care until it is very late in the course of their illness. Too late, in my view, to benefit fully from what this holistic, interdisciplinary and profoundly compassionate care can offer. I believe we have come to a “tear down this wall” moment in end-of-life care. Tear down the wall that separates palliative care and hospice care; end the tyranny of the six-month cutoff for eligibility. Tear down the wall that separates people who still want to continue treating their illness from those who can accept a natural death. It’s time to develop a health care policy and payment system that embraces concurrent care without costing taxpayers more than the current system that is fragmented, costly, often dysfunctional and unsustainable. End-of-life care involves so many intertwined issues that must be addressed. Just a few: better education and training for physicians and nurses; better training and better pay for the home health and personal care aides who are on the front lines of caring for the very ill; coordinated care aimed at helping people live as well as possible and in their homes as long as possible, without hospital readmissions; focusing more on culture change and person-centered care in long-term care settings; and more effective ways of providing dementia care. But public policy changes would have a huge impact on all these issues. How do we get to a better future? In a June 2015 Health Affairs article about what is ahead for Medicare’s next 50 years, former Senate Majority Leader Tom Daschle defined his prescription for success as: good public policy, superior technology and enlightened leadership. It seems to me that this prescription misses one element, which is public engagement. Transforming hospice care will likely not happen without vocal and insistent advocacy from all of us. So it’s time for my fellow aging baby boomers to tap back into our activist genes and start insisting on the kind of care we are all going to need in the not-so-distant future. The Aspen Institute Health Strategy Group is part of the Health, Medicine and Society Program at the Aspen Institute. Co-chaired by former US Health and Human Services Secretaries and Governors, Kathleen Sebelius and Tommy Thompson, its 24 members are senior leaders across influential sectors: health, business, media, technology and more.